Rate this Article A new and innovative Steam VR headset coming from giant consumer electronics manufacturer Lucky-GoldStar. LG Electronics has been one of the top South Korean companies in the field of consumer electronics and appliances. The company started way back in 1958 (just after the Korean War) and was named GoldStar. By 1995 it had merged with the Lak-Hui (pronounced "Lucky") Chemical Industrial Corp. changing the name to Lucky-GoldStar. Today, the company is simply called LG Electronics. 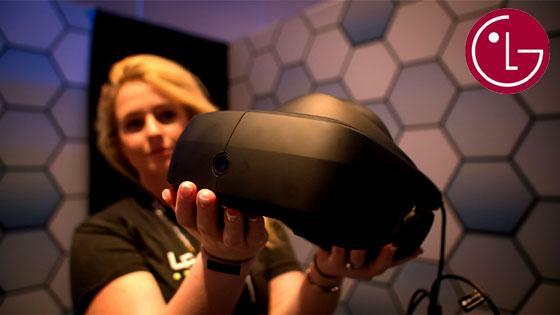 Just recently, LG Electronics has announced a tie-up with Valve and showed their prototype VR headset to the public. Aside from making LCD and LED TV sets and other appliances, the company had branched out to smart phones and mobile devices. It was just a matter of time to get into the development of VR as their no.1 competitor has already ripped the benefits of the technology with the Samsung Gear VR. LG then chose Steam VR as the platform for their upcoming headset as Valve has announced several times in the past that Steam VR will not be limited to the HTC Vive but will welcome other HMD manufacturers to create a healthy product competition and a wider selection for its user base. The LG Steam VR at its core is actually the same as the HTC Vive but with added features. The company aims to provide users with a better performance headset giving them an option to choose the device and brand which is the more comfortable for them to use. LG VR uses the same basic room scale technology as the Vive with the two Lighthouse sensors placed at diagonal locations to track the movements of the user. The prototype’s performance is quite comparable to the Vive and uses the Steam VR platform effectively as well. To begin with, the headset uses a 3.64-inch diagonal display with a 1440 x 1280 resolution per eye lens, 110-degree field of view and a refresh rate of 90Hz. This give it a higher performance compared to both Oculus and Vive in terms of resolution. Also, LG uses smooth refractive lenses which give a clearer output. Aside from this, LG has improved on the dual handheld controllers by slightly changing the shape of the trackers at the ends (circular to pentagonal) and moving the positions of the buttons to avoid confusion for the user. The design of the headset is what really compares itself to the other two. It kind of looks like the PS VR headset and uses sort of a ring-band worn on the forehead and can be tightened at the back. A second band is used to balance the weight. It can be tighten around the head by ratcheting the sides in, and adjusting a scroll wheel at the back. Overall, the device feels more like a helmet than goggles that are strapped to your face. The major feature of the headset is that you can actually flip the VR mount (screen, optics, electronics and housing) up and down like a helmet visor so you don’t have to take it off to get in and out of VR. This feature can prove to be a great plus as it saves a lot of time and effort particularly for VR developers who have to get in and out of VR while building and testing their applications. Note however that the HMD is still a prototype and is still very much under development. It is being presented to the public during trade and electronic shows to get actual feedback from users so both LG and Valve can adjust the needed features for a much improved and better product upon final release. Some of the feedback gathered relate to the actual distance of the lenses to the eyes of the wearer or the PID which still cannot be adjusted. A camera on the front of the visor which is supposed to be used for pass-through video viewing might be rendered useless since you can flip-up the visor anyway, but then again, you would have the option to be able to see your companions or other people making fun of stupid looking you while you are in VR. The audio also leaves much to be desired as you still have to use third party headsets or earphones for your VR hearing requirements. The headset is heavy as it becomes an issue that must be definitely dealt with. Finally, we come to the cable. The headset uses a single USB type C cable that carries both power, data and display signals. The standard cable is quite short and doesn’t provide enough leeway for a more flexible user movement. LG representatives however explain that they will be providing an option for much longer cables but the company is developing a remote box interface that can be strapped to the waist to which the short cable connects to, thus eliminating the need for cabling all the way to the PC. When LG pulls this off, they would have such innovative features that would definitely place them ahead of the competition. For now, the consumer public can only wait for the much anticipated final release of this new VR product and hope the device will live-up to user expectations and beyond as the LG Steam VR is expected to announce final price and release date within the year.